According to experts, it’s wise to own an AA flashlight, an AA flashlight and a multi-purpose torch if you’re spending time in the wilderness. For camping, hunting, fishing or hiking, each flashlight will serve its purpose. For building camp fires, for building a make-shift shelter, for hunting or fishing, the best AA flashlights are a must have. 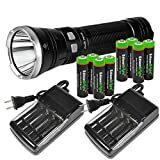 There are cheap flashlights on the market today and the following are considered the Best AA Flashlight recommendations for both quality and affordability. Gerber Infinity Ultra Task Light. White LED light. Waterproof, anodized construction of this flashlight makes for quite a sturdy unit. When darkness is the archenemy of productivity, grasp your fingers around theGerber Infinity Ultra Task LED Flashlight, Black [22-80012]. A pint-sized but powerful L.E.D. light featuring Gerber’s patent pending technology. Its the kind of light you want when the space for gear is limited and the need for brilliant light is mandatory. 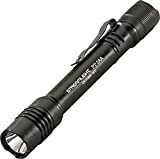 Just over 2 ounces this little flashlight is great for backpacking or hiking and since it is waterproof to 3 meters, you can rest assure that if your caught in a monsoon its ok. The strong anodized aircraft aluminum is lightweight and extremely durable. Like others this is a great buy for the Best AA Flashlight category. Eight EdisonBright AA NiMH rechargeable batteries and chargers included. Although on the slightly larger side for AA flashlights, we just had to add this torch to the Best AA Flashlight list. Mainly in part to the massive 860 Lumen output for over 2 hours, this tactical flashlight caught our eye. Using 8 AA batteries the Fenix TK41 has 2 modes but 4 brightness levels which includes the SOS and Strobe which is hard to find in the AA models. Made from the aircraft aluminum you know it can take some abuse as well. You might consider using the Fenix TK41 as the best AA flashlight for around the house, camping, keeping in your vehicle survival kit. Overall, it is a great addition to anyones collections of flashlights. On the extreme opposite end from the 8 AA battery Fenix TK41 the Streamlight Protac uses just 1 AA battery and reached ahead of others for the 3rd spot on our Best AA Flashlight list. It only comes with a 70 Lumen high output as its peak output but unlike other 1 AA battery lights, it has a strobe and can run for 4 hours. It using the low mode it can run for 32 hours, enough for you to climb out of any cave or wilderness you may find yourself. Durable, anodized aluminum construction with impact-resistant tempered glass lens and anti-roll head. Overall this is a very simple yet reliable flashlight and would be a great addition for anyone looking to find the best AA flashlight. Not all AA flashlights are of good enough quality for everyday use or even wilderness survival. They are used for a multitude of tasks so you will want one that will last. The three best AA flashlights described above should serve you well and they are affordable. As you shop for the best flashlight, be sure the body is not easily breakable. It should have a quality LED or CREE bulb and made from strong plastic or aluminum. Should be able to manage the power from the batteries for at least several hours. If you think we got this right, we would love to hear your thoughts or maybe you have a better flashlight that would qualify for the best AA flashlight list. Please leave your thoughts or email us your review. For more information about all the best flashlights out there, check out our flashlight comparison chart.